Upon the Invitation of Mr. Fariz Ismailzada, Vice-rector of Azerbaijan Diplomatic Academy (ADA) University, Mr. Ciopraga, Secretary General of the PS IGC TRACECA addressed a speech within Baku 9th Annual Summer Energy School. 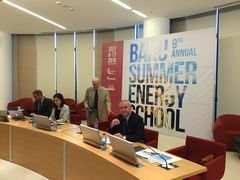 BAKU SUMMER ENERGY SCHOOL (BSES) is an annual two-week certificate program of the Caspian Center for Energy and Environment (CCEE) of ADA University held in July in partnership with the State Oil Company of the Azerbaijan Republic (SOCAR). It brings together world-renowned scholars, academicians and policy makers to examine and gain a better understanding of global energy and environment issues and their practical application. Mr. Ciopraga informed the participants on the latest development of the international transport corridor in the region of Europe-Caucasus-Asia, strategy and future action plans in the context of achievement of effective sustainability of each state and integration with global world economy. In addition it was mentioned that joint cooperation in the achievement of common goals, commitment to internationally recognized standards will ensure the constructive solution of current issues and their efficient performance.